The following article is reprinted with permission from Edible Ojai, an award-winning quarterly magazine serving the agriculturally-rich Ventura County area in California's Central Coast. The magazine promotes the abundance of local foods, celebrating the region's small family farmers, farmers' markets, local chefs, and others interested in local, organic foods and sustainability. Green Schools Initiative is partnering with Food for Thought Ojai and the Ojai Unified School District on the Wastestream Project, aimed at reducing the waste produced in the school district. Local food. If you’ve picked up this magazine, this is probably the topic you are expecting to read about. Well, what about local trash? This is the other end of the food and eating cycle—what’s left over: the packaging, takeout containers and utensils, disposable plates, food scraps and the paper and plastic bags to get the food home. We have created a global trash system parallel to the global food system and we need to localize it as well. When it comes to throwing something away, where is “away” on our finite planet? “Away” most often means a landfill, or sometimes an incinerator. But landfills and incinerators are parts of our communities, which can pollute our air and water supplies or use valuable land. According to the U.S. Environmental Protection Agency, Americans generated 251 million tons of municipal solid waste—a fancy name for trash—in 2006. Residences accounted for 55–65 percent of this, while schools and businesses accounted for about 35–45 percent. These figures do not include industrial waste or hazardous waste and are generally considered an underestimate. We recycle about 33 percent of this amount—which is great!—but we still send two-thirds of our waste to landfills every year. In 1960, an average American produced about 1.8 pounds of trash per day, and now it’s about 4.5 pounds per day. While schools are big generators of trash, they are also uniquely able to influence a new generation to think about trash not as garbage but as a local treasure, perhaps like local food sources. Huh? Local trash is treasure? Well, ask some fourth and sixth graders at schools in the Ojai Unified School District (OUSD) who are participating in the “Up and Down the Wastestream Project” in partnership with Food for Thought Ojai (www.foodforthoughtojai.org), and you may get some enlightening answers. Building on Food for Thought’s Healthy Schools Project, which for the past five years has sponsored garden-based learning and agricultural literacy in OUSD, the partnership launched this project to address the other end of the food chain: disposal. They saw mounting evidence that precious food was ending up in the garbage together with mountains of paper, packaging, plastics and other trash. The Wastestream Project is an effort to reduce the school district’s overall waste by integrating the “four Rs” of waste reduction—Reduce, Reuse, Recycle, Rot—into the schools’ existing “three Rs” curricula (Reading, Writing and ’Rithmetic). The students and teachers at three pilot schools (two elementary and one high school) are auditing the trash generated at each school, identifying problems, proposing solutions and educating their classmates, teachers and parents about what they can do. What have they found in their treasure hunt through the trash? Students at Topa Topa and Meiners Oaks elementary schools found that about 80–90 pounds of trash are being generated in the school office every week, and that between 580 and 760 pounds of trash are generated at lunchtime every week. Using their math skills, they estimated that for one school year, these two schools are generating about 27 tons of trash! The garbage hauler estimates that these two schools actually generate more like 68 tons per year (the kids didn’t audit food service, all the classrooms, shops and other areas of the school). While these results are not scientific, they offer a glimpse into how much we waste every day. You can use your math skills and estimate the tons generated by all of California’s 9,000 schools every day. Students found the largest categories of waste by weight to be paper, food scraps and unfinished drinks. They were amazed to see how much uneaten food and unfinished drinks are simply thrown away! Plastic-wrapped utensils and napkins are thrown out unopened. 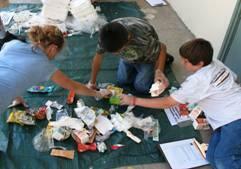 Other trash includes cardboard, snack bags, juice boxes (that can’t be recycled), plastic bottles and aluminum cans. • About one-fifth of America’s food is thrown out each year, or about 130 pounds per person going to the landfill, which could have fed roughly 49 million people, according to the U.S. Department of Agriculture. Less than 3 percent of food waste is composted. • Americans use enough paper every day to circle the Earth 20 times, about 67 million tons of paper per year. Using one ton of recycled paper can save 17 trees, 380 gallons of oil, three cubic yards of landfill space, 4,000 kilowatts of energy and 7,000 gallons of water! • Recycling one aluminum can saves enough energy to power a laptop computer for 4 hours. And in 2004, Americans threw out 51 billion cans, equivalent to billions of hours of electricity! Students at OUSD are now starting to test new systems for separating their trash and recyclables, expanding the worm composting of some food scraps, reusing scrap papers, packing waste-free lunches, monitoring the sorting at lunchtime, and doing a better job of finishing their milk and lunches. The goal is to reduce the overall amount of trash going to the landfill. At schools across California, students and adults are becoming more familiar with the four Rs. The San Francisco School, an independent school in the Bay Area, has reduced its trash by 93 percent with enthusiastic participation across the whole school community. The San Francisco Environment Department gave cash rewards to the school’s custodians for their efforts. In Alameda and San Francisco Counties, waste haulers have access to a commercial-scale compost facility and are able to collect large volumes of food waste from schools, restaurants and residences. Food scraps are mixed with yard waste and the compost is sold for gardens. Oak Hills Elementary School in Ventura County set a goal of zero waste generation, modeling its program on the Sacramento area’s Oak Park Unified School District. They have focused on packing waste-free lunches and only reusable containers are allowed. The 500 students only fill one 55-gallon can of trash during lunch, whereas they previously filled eight cans. Student trash monitors at lunch help the program work, and kids are educating their parents about how to shop to avoid excess packaging. In fact, it’s the law that schools work to reduce their waste. SB 373 was passed in 2001 and requires the California Waste Board (www.ciwmb.ca.gov) to assist school districts with integrating environmental education into standards-based science curricula, and provides grants and technical assistance to schools. This complements other laws that require cities and counties to divert 50 percent of their solid waste from landfill disposal. So, while we are learning to value our local organic farmers and their contributions to environmental sustainability, we should also begin to value our local recyclables as a rich commodity to be mined for compostables, metals, paper or plastics. We should aim to recycle 100 percent of what is recyclable. While trash is valuable, less trash is even more valuable. While baby boomers became the “trash generation,” there are hopes that the Millennials will become the “zero waste generation,” if they can be influenced early enough. Schools are creating opportunities for kids to develop their own innovative and inspiring ideas for making the four Rs a reality beyond the schoolyard. Ojai students are considering advocating for citywide bans on plastic bags and development of commercial-scale composting facilities for the whole county. Will Ojai adults heed the advice of their students? Maybe they need to attend summer school on the four Rs taught by their children!